Sarita's passion for performing for kids and families is currently being nourished by her band, Octopretzel. She recently produced and engineered the band's new album "If I Were a Song...", whose title track she also composed along with several other songs on the album. 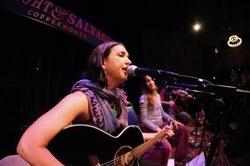 Please click on the pages above to learn more about Sarita's work, watch videos, hear songs, and buy albums. Thanks for stopping by. Sarita would love to hear from you, drop her a line! She is currently taking a leave of absence from the Bay Area and will be working with kids and recording music in Bali, Indonesia. To read about her adventures, check her Blog!